It’s not only that the design is great, but also it is being operated and maintained by SAP. No more patches and updates, no more backups, and no more scaling servers. You gain responsive design ‘out of the box’, way simplified administration and maintenance environment, a portal which is secured while open to the internet, leverage pre-packaged apps and templates, take advantage of the SAP Fiori design (including: launchpad, Fiori apps, My Inbox, Notification Center, etc.) and more. So, let’s have a deeper look at some of the key capabilities which will help you transition to the Cloud. When starting your transition project, you will have to decide which option you would like to take. There is no ‘one size fits all’ answer for this question, it depends of your UX and functional requirements. 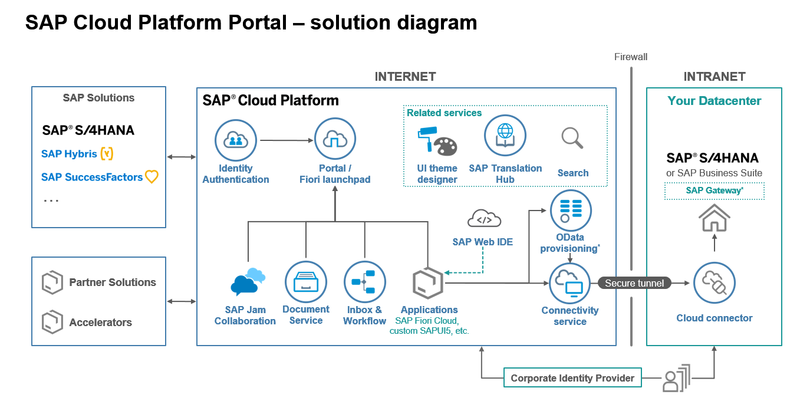 Consume existing business applications – Cloud Portal provides the unique functionality to integrate the following UI technologies directly in Cloud Portal: SAPUI5, Web Dynpro ABAP, SAP GUI for HTML, BSP, , SAP Screen Personas, SAPUI5, Bex reports, URL. We provide a dedicated migration guide to help you transition from the Universal Worklist to the My Inbox app. Read more in SAP note 2538184 – Migration Guide for UWL to My Inbox. Our partner Egnyte, has recently released a migration tool from the SAP Knowledge Management (KM) component to the Egnyte offering. It is recommended to look at the Egnyte migration tool. Check out the below diagram that is relatively self-explanatory. As you can see – from now on, your portal is operated by SAP (on the cloud) while integrating to your business process, SAP and non-SAP. Your core business systems stay wherever they are deployed today, on premise or cloud, only your UI integration layer (meaning, the portal), is moving to the cloud. For more details about Cloud Portal architecture and the how to leverage unique architectural options that will provide best performance & security, read more about External Access Point and Internal Access Point. I hope that this blog gave you some more insight about the transition to Cloud Portal, we still did not discuss topics like authorization, security, branding and roles. Post your questions below and I will do my best to answer. OK, if you got to this point in the blog, you may also ask yourself where can I learn more. Here are some very good links to start with: learning journey, blueprint (coming soon), create your first portal site tutorial, roadmap, deployment options recommendation, our community page and finally the openSAP course (stay tuned for an updated course later on this year) and SAP Cloud Portal Administration and Operations course. Sorry I am little confused.. Is Fiori cloud and cloud Portal (Fiori launchpad template) same? Cloud Portal (or Portal service) is a service on SAP Cloud Platform to build Portal sites. There are mainly two templates which can be used for this – Fiori Launchpad and Freestyle sites. Fiori Cloud is a packaged offering on SAP Cloud Platform which includes variuous services. The key services are Cloud Portal, Identity Authentication, WebIDE and collection of standard Fiori apps on SAP Cloud Platform. Thank you Murali for reply. Why would we not recommend using SAP Jam for Knowledge Management as this is one of its capabilities, rather than recommending Egnyte? Really nice blog Aviad Rivlin – really like the architecture diagram included as well. Nice links and overall great blog.